ShanghaiTex 2017, the 18th International Exhibition on Textile Industry, returns to the Shanghai New International Expo Center (SNIEC) November 27-30, 2017. 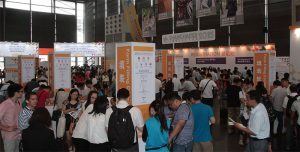 This year, show organizers — Adsale Exhibition Services Ltd., Shanghai Textile Technology Service & Exhibition Co. Ltd. and Shanghai International Exhibition Co. Ltd. — are embracing the theme of Industry 4.0 and promoting “Textile for Smarter Future.” The show will focus on the ideas of advancing production, digitalization, sustainability and servitization. Organizers anticipate more than 1,200 exhibitors will show their technologies on a trade show floor covering at least 103,000 square meters over nine halls. More than 60,000 visitors from more than 80 countries are expected. The last edition held in 2015 attracted 1,200 exhibitors and 55,049 visitors from 67 countries and regions. Show sponsors include ShangTex Holding Co. Ltd., China Council for the Promotion of International Trade Shanghai Sub-council, and China Chamber of International Commerce Shanghai Chamber of Commerce. In addition to the exhibit halls, ShanghaiTex will host seminars, networking events and new product and technology launches. Highlights include a denim mastermind, Evolution of Sports Shoe Tech and Sports Bra-ology seminars; a Smart Textile Innovation Forum; Wearable Technology X Textile Design Competition; Smart Textiles Showcase; Sports 3-D Printing Technology Showcase; a Buyer’s Forum and Business Matching; and Smart Factory & C2M [customer-to-manufactory] Experience Zone featuring a Textile Industry 4.0 Forum and Smart Manufacturing Technology Showcase. The new C2M Smart Factory Experience Zone will highlight 3-D scanning, 3-D printing, textile automation, management systems and e-commerce platforms to demonstrate the workings of a smart factory. ShanghaiTex visitors will gain hands-on experience using the equipment and technologies found in the zone and will have access to a professional team who can answer questions about Industry 4.0 and help industry players improve productivity and remain competitive in the fast-changing marketplace. ShanghaiTex admission is free, and visitors may preregister online or register on-site during the show. For more information about ShanghaiTex 2017, please visit shanghaitex.cn.